When the words “Money In The Bank” are uttered within earshot of a wrestling fan, few things will come to mind. Edge’s opportunistic cash-ins, the chaos itself of the MITB ladder match, past winners and probably the easiest tie to the phrase – 2011 – when CM Punk shocked the world and “left” the company with the WWE Championship after a money match with John Cena. MITB has become a tradition itself and what does one do with tradition? They carry it on with new generations. What happens when “The New Era” (wink, wink) collides with this concept? Thanks to a tightly packed uppercard with three WrestleMania-worthy matches and a crazy ending, it was easily high on the list for Pay-Per-View of the Year. 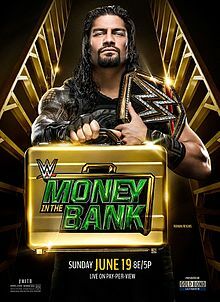 Calling it the “Greatest MITB in history” before the show even streamed live was a bold statement, but one that could be hard to argue. – R-Truth and Goldust have become best on-again off-again buddies for almost six months now. The time for Golden Truth to string together some wins was now or never. On the other side, there has been the Zoolander-esque pairing of Fandango and Tyler Breeze. Put the two together for a match, you might have something. As far as their match, it was hard to criticize on a wrestling level since the majority of it was GT purposefully irritating the “burned” (peeling skin and all) heels, because GT had intentionally raised the temperature of the tanning booth their opponents went in earlier in the day. Comedy was the bout’s goal and it succeeded on that front thanks to the timing chemistry of Breezango, but besides an out for GT to get their first victory, this was mostly forgettable. We do love the GT t-shirt though that’s on WWE Shop. Once they wear it on TV, it’ll be a riot. – The Lucha Dragons-Dudley Boyz match was fit for pre-show material, but didn’t disappoint. It was fairly formulaic though and easy to predict. They haven’t done anything interesting with the Dudleyz since their heel turn and LD have been stuck in a rut as of late with no direction. This of course was lightly mentioned by commentary, but besides some crowd-pleasing spots thanks to the luchadores, the match itself served little relevance. LD got the win in a bout that wasn’t bad, but not one you’ll remember unless you have to. – Given that the show came from Las Vegas and the “risky” nature of the MITB concept, the opening video was an easy tie-in to the city itself and emphasized the “All In… One Night” theme (get it?) and it was a cool little video too that recapped several big feuds. Granted, Ring Of Honor did the same for their 14th Anniversary Show, but it makes sense. – The WWE World Tag Team Championship fatal four-way between Champions Kofi Kingston/Big E, Enzo Amore/Big Cass, The Vaudevillains and Luke Gallows/Karl Anderson started with structure, but ended up a train wreck style bout by the end. The crowd was quite hot for the Enzo/Cass duo, as Enzo had a good mic night with his slot pants and all. Even New Day got big laughs with their schtick as they ripped on their opponents before the first bell. Michael Cole again brought up their Tag Title reign length at 301 days, on an approach to the all-time 334-day reign from Paul London/Brian Kendrick and we wondered if this was the night for Enzo/Cass. There was a nice reaction to the four-team stand-off and we especially liked how each of the other teams had a moment where there was a close near-fall for them. The roof would’ve went off the building if Enzo/Cass actually got that three-count (teased a little close for comfort, thanks Ref) but at the same time, they weren’t down about the real finish when Kingston got the pin. We almost thought that New Day would get booed over Enzo/Cass losing, but that didn’t happen. Great opener. – Just when we got the laughter out of our system, it was time for the night’s first buzzkill – Baron Corbin vs. Dolph Ziggler. Ugh. The vocal crowd wasn’t shy to poop on the slow pace and even though they attempted to quicken it, there was nothing highlight-worthy besides the Deep Six on the floor and what led to the finish where Corbin hit the End Of Days. Can we please end this feud now? – Speaking of more feuds that don’t end, the Women’s Division has become an unfiltered mess. The dominant story has been the egotistical attitude of the WWE Women’s Champion Charlotte and how she dumped her father Ric Flair and took Dana Brooke under her wing in an odd alliance. On the other side, Natalya (the “do-gooder veteran”) and Lynch (the true babyface) have bonded in battle with these ladies. The tag match between the four was decent, all things considering. In a match where the Women’s Championship wasn’t on the line, they had an out for Charlotte to lose, but they opted to go another route as Charlotte hit Natural Selection on Natalya to win. The most interesting thing of the whole match was Natalya’s post-match turn on Lynch, which could only mean good things for the Division. It’s not like Natalya was actually going to beat Charlotte with her current character. Lynch also continues to get built as the strong babyface, at least until Sasha Banks returns. Yes, the crowd chanted for her too. – Dean Ambrose’s backstage promo put over his “lack of strategy” and the MITB dangers as punishment you couldn’t avoid. Liked his serious tone as it was separate from his other cutesy promos. He also mentioned how he rooted for WWE World Heavyweight Champion Roman Reigns in the main event. – In a variation of the “New Era vs. Old” storyline, we also had the Sheamus-Apollo Crews match. We assumed this was used to get Crews over in an early feud where he could shine. Sheamus was a known face who wouldn’t necessarily be damaged either from it. Liked that the bout started hard and heavy before it greatly slowed down once Sheamus took control. Crews’ athleticism provided some nice moments (the apron moonsault comes to mind) before his determination took over as he kicked out of a second-rope White Noise and quickly pinned Sheamus thereafter to sneak away victorious. Easily Crews’ best match to date and we’re sure this feud is beginning to get warm. – We drew a lot of comparisons between the AJ Styles-John Cena match this year and the Kevin Owens-Cena match from last year. You had almost the same situation and the same pumped-up crowd for an electric atmosphere. Styles was technically the heel, but played to the crowd and encouraged them to cheer for him. There was great storytelling of how Cena threw everything he had at Styles, but couldn’t get enough momentum going because Styles changed his techniques up. The first 23 minutes of this was about as perfect as you could book it. The near-falls were well-done and they kept going and going. Now… to the finish. Some may sour on it for how it “ruined” the match because it went back on the promise that Gallows/Anderson wouldn’t interfere, as per the contract Styles signed. However, in this feud, Styles has been the betrayer and one firing the cheap shots. He’s the heel here, so it wasn’t out of character to find some way to bend the rules so his buddies could help him win. Didn’t think they needed to “debate” whether Styles was conscious to realize he was getting help, as it contradicted what his character would do, but they didn’t focus too much on that. Think about it: this was his first big victory. True, it wasn’t clean by any means, but he can say he beat Cena. This also creates the need for a rematch between the two that’ll probably feature some sort of stipulation. – As far as where this MITB Ladder match ranks that featured Jericho, Owens, Del Rio, Ambrose, Sami Zayn and Cesaro, it’s pretty up there. These six guys all gelled together and had total intent to wreak havoc with a ladder. We saw some things usually never done – the Michinoku Driver by Zayn on Owens on the side of the ladder (brutal) comes to mind. Cesaro was also a highlight machine throughout. The spot where he jumped off a ladder and then did a springboard uppercut was downright jaw-dropping. We also had him do his signature toss on Jericho into a ladder, which just hurts. The set-up of the ladders themselves for certain spots seemed to take a little too long, but it didn’t hinder the violence at all. Just when it looked like Owens would possibly win, Ambrose same out of nowhere and knocked him off the ladder and onto another one (ouch) and took the briefcase down. Rabid reaction. This stole the show to this point. – The WWE United States Championship match between Champion Rusev and Titus O’Neil was overall weak, but served its purpose as a “come down” bout after the previous two matches. It never felt like O’Neil was a big threat to take down Rusev and the fans genuinely like him, but they weren’t feeling this a bit. Their styles also didn’t mix well enough to be interesting. Luckily, Rusev won with his original Accolade to retain his belt. You could argue repeating 2014 with Rusev’s a bad idea, but we won’t. They should’ve stayed this course with him the whole time. – The WWE World Heavyweight Championship match between Champion Roman Reigns and Seth Rollins had a deep story on both sides of the spectrum for fans to be invested in. Reigns looked to cement his reign by putting down the one guy he hadn’t beaten, while Rollins was hellbent on “reclaiming” what he never technically lost. As you’d expect, the crowd was over for Rollins over Reigns by plenty. As far as face-heel alignment, it felt like the roles switched. Reigns did the trash-talking, while Rollins did more of the crowd-pleasing stuff than usual. It was a good, yet smart formula with this crowd. Even though the bout was physical, there were lull points that people just tuned out for. Not sure what they did with the Reigns barricade spot, but we figured it was an out for a possible loss. Some nice near-falls down the stretch for both men, but multiple Pedigrees later, Rollins got his redemption to a big pop. Just when the night was ready to be set and done, out came Ambrose to cash in as we saw karma affect Rollins in all its glory. Yup, it took a shot with the briefcase to Rollins’ head and a Dirty Deeds and we had yet another new WWE World Heavyweight Champion. This garnered an even bigger reaction. This was an interesting situation. On one hand, all three Shield members held the gold at points of the night. Reigns lost cleanly and didn’t factor in the second match, so he lost a bit there. Rollins could brag that he beat Reigns clean and seems sympathetic from the opportunistic Ambrose, who came away on top for the first time ever. Needless to say, it was a fun way to end the show and left us looking forward to the next night’s Raw. Posted on July 13, 2016, in WWE and tagged AJ Styles, Alberto Del Rio, Apollo Crews, Baron Corbin, Becky Lynch, Big Cass, Big E, Booker T, Breezango, Byron Saxton, Cesaro, Charlotte, Chris Jericho, Corey Graves, Dana Brooke, Dean Ambrose, Dolph Ziggler, Enzo Amore, John Cena, Karl Anderson, Kevin Owens, Kofi Kingston, Lana, Lita, Luke Gallows, Mauro Ranallo, Money In The Bank, Natalya, Renee Young, Roman Reigns, Rusev, Sami Zayn, Seth Rollins, Sheamus, The Dudley Boyz, The Golden Truth, The Lucha Dragons, The Vaudevillains, Titus O'Neil, Xavier Woods. Bookmark the permalink. Leave a comment.